handle:Paper handle, Ribbon Cotton handle, chemical fiber, nylon handle with color printed also workable and Ribbon Ornament ... Handle Reference. Nomal Small Order Quantity:3000pcs -5000pcs per style/Size/artwork. Product Time: Usually 20-30 days after firm order. Transportation: By vessel FOB / CIF /EXW , can arrange air shipping samples to clients' office directly. Customer designed artworks are welcome, we can design artwork that follow your comments too. OEM Service Offered, Design Service Offered. base on your quantity, after sample approval and deposit received. The normal production time for Apparel Bags is 20-25days. The normal production time for Apparel Boxes is 25-30days. 30% TT deposit, balance before delivery or against copy BL. Other specific issues can negotiate. 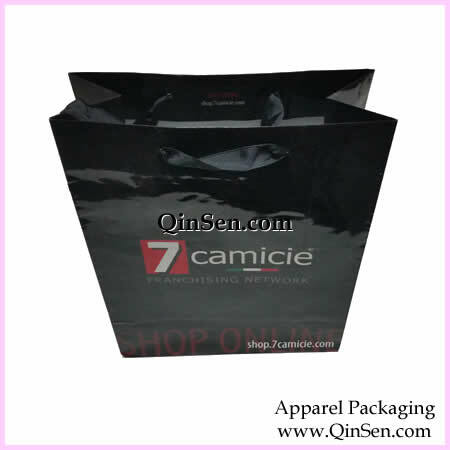 2,We provide high quality clothing box , paper shopping bag and printing packaging in China with the reasonable price. 3,We provide the best service, which includes the suggestions on the designs before the production, subsequent using instructions, etc. 4,We are professional and experienced to save your valuable time. 1) choose the product you need and send us an inquiry. Our products are all tailored specifically to your needs- size, printing, quantity, etc. Pricing varies greatly between all of these factors and hence must be determined on a per order basis. How to Building Your Brand? If you interested in Style:GX00620,For more details pls feel free to contact us. we will reply you as soon as possible. If you can not receive the E-mail with our response, please check your spam folder. Copyright © 2008 -2019 www.Qinsen.com, All Rights Reserved.